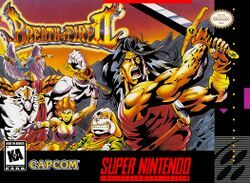 Breath of Fire II, known in Japan as Breath of Fire II: The Fated Child (ブレス オブ ファイアII 使命の子, Buresu obu Faia Tsū Shimei no Ko? ), is an RPG developed and published by Capcom. First released in 1994, the game was licensed to Laguna for European release in 1996. It is the second entry in the Breath of Fire series. It was later ported to Game Boy Advance and re-released worldwide. The game has been rated by the ESRB for release on Wii's Virtual Console; Nintendo of Europe's website mistakenly announced it for release on July 27, 2007, but was released two weeks later on August 10, 2007. The game was released on the Virtual Console in North America on August 27, 2007. This page was last edited on 27 January 2018, at 19:50.